A simple QRP transceiver with full QSK for the CW sub-band of 40m. It uses two valves, a 6AQ5 pentode, and a 12AX7 double triode. This has excellent gain, and good sensitivity is obtained. For comparison, the sensitivity was higher than the rockmite, SST, pixie and CRK-10. The power output obtained was 4W. Operation: In TX mode, the valve acts as oscillator and transmitter. In RX when the key is released, the valve current decreases, in which case it generates a small signal. This signal, along with the signal coming from the antenna, is taken to the germanium diode, where mixing occurs. Audio is injected into the grid of the first triode, where it is amplified. The second triode further amplifies the audio signal, driving the headphones. The headphones can be those of an MP3 player, these worked very well. The c omponents are not critical, can be varied within certain limits. The oscillator valve may be 6BQ5, 6DQ6, etc. As the crystal used was an HC49 type, it would be interesting to connect in series with the crystal a common LED, and 470-ohm potentiometer in order to limit the current on the crystal. For safety this should be limited to around 10mA. Both inductrs can be obtained by winding about 100 turns of thin wire on a ferrite rod. Otherwise use molded chokes, with value 100uH, 220uH, etc., which must be connected in series to get a value between 1 and 2mH (millihenries). For QRP, I used four 220uH inductors connected in series, and it worked fine. For other valves, these chokes would not stand the plate current. In this case, it would be best to wind the RF choke. The diode detector was a IN60, but others could be used. Finally, instead of the RF choke connected after the capacitor of 10pF, a choke of 10uH could be used in parallel with a variable capacitor in order to have a tuned circuit if there is motorboating noise in the circuit (which did not occur with the prototype). In summary, experiments can be done with this circuit in order to always try to improve performance. Various contacts have been carried out regularly with this transceiver. Goal: use modern components (except the valves hi hi). Click this photo below, to see the full size version, with Portugese text. 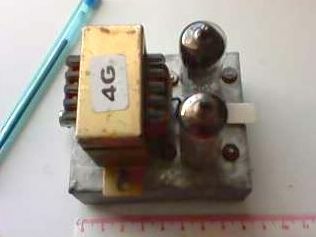 A transceiver for the 40m band. It uses common components, easy to find in the junk box. The components are not critical and can be determined by experience. Adjustment begins with the trim pot, adjusting it to have a 1mA current in the drain of the FET transistor, without signal (disconnect the transistor and the BD139 crystals). Then put back these components, and following with a dummy load, set the coil L in the tank circuit until you get maximum power. It ought to be around 10W or more. When you release the key, the current in the oscillator transistor decreases, causing it to act as a signal generator, which is mixed by the diode with the signal from the antenna (the 1M resistor acts as bias to the silicon diode, increasing the sensitivity). The resulting signal is amplified by a TL431 integrated circuit. Other ICs can be used, such as the popular LM386. As for the FET, you may experiment with other devices to obtain other power output. Advantages: Power of about 10W, good sensitivity (good enough to copy colleagues' QRG), circuit simplicity, uses junk box parts, clean audio. Disadvantages: The same found in any QRP transceiver for direct conversion. An audio filter solves this problem. It requires a well-filtered power supply, or use a 12V battery. Use heat sinks on the transistors. 4) 6 turns adjustable wire on ferrite core, diameter 10 to 15mm, wire diameter 0.5 to 1mm.